I don’t see that much of an issue. The damage will be less spiky, so you will get a nice steady stream of damage. I wouldn’t make any changes to your gearing strategy just yet but with getting hit more, Reckoning is looking more attractive. I am not a person that dwells on guild ranking systems/websites but Guild Ox has my guild Initech tied to be the top rated 10-man guild on Cairne (in progress and achievements). Not bad for a casual guild that raid a few nights a week. Congratulations to Initech! 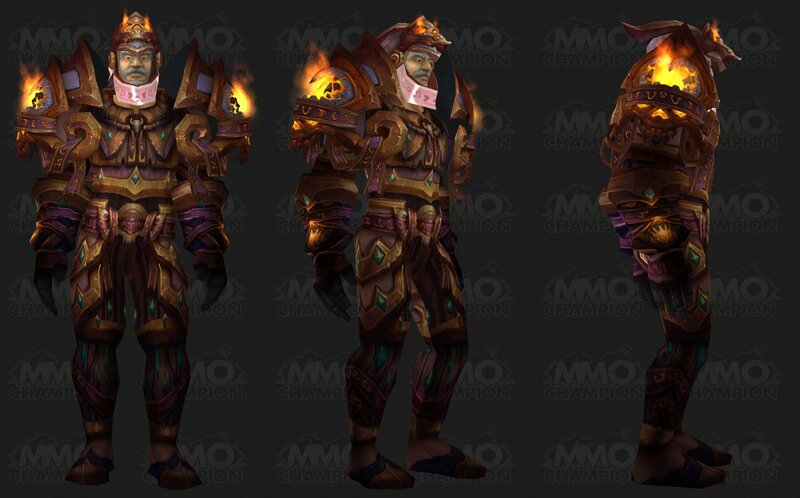 MMO- Champion just posted pics of Paladin’s Tier 10 armor. I’m not impressed. Sorry, compare to the other armor sets this is the worse. I would be ok with the armor if Blizzard fixes the helm. Not the bugged part (the pink neck brace) but face guard. It is open. I am not understanding why that part is open. I hope Blizzard comes to their senses and closes the helm. I came across a nice little addon called CLCRet (Retribution FCFS helper). This addon will show you the next spell/attack you should use within your FCFS rotation. Not only will this addon help newcomers learn the FCFS rotation but will help experience players tighten their rotation to maximize their DPS. I’ve been leveling up my warlock (64 currently) through questing and the battlegrounds, mostly through Alterac Valley. One thing is annoying me while waiting for AV to start, not the immature chat but the constant spamming of Path of Frost. When you have 14 death knights in a single AV spamming PoF, it can cause horrible latency then I have to lower my volume so I wont hear the sound effect. Blizzard please put a 2 minute cooldown on Path of Frost. My ears would love you…. I thought Glyph of Divine Storm was a pointless glyph until now. If you are part of Yogg’s portal group (10), you can heal the group with glyph of Divine Storm and judge light. The damage from the adds are not that high so your heals can compensate for the loss of health. Then when you enter into the brain room, you can heal the group while DPS’ing the brain with no change to your FCFS rotation. This basically eliminates the need for a healer to enter in the portal. (UPDATE) 2P Bonus – While your Divine Illumination talent is active, your healing spells are increased by 35%. (UPDATE) 4P Bonus – Your Holy Shock spell causes the next Holy Light you cast within 10 sec to have 0.3 sec reduced cast time. (PREVIOUS) 2P Bonus – The cooldown on your Divine Favor talent is reduced by 60 sec. (PREVIOUS) 4P Bonus – Your Holy Shock spell causes the next Holy Light you cast within 10 sec to have 0.3 sec reduced cast time. 2P Bonus – Your Hammer of the Righteous ability deals 20% increased damage. 4P Bonus – When you activate Divine Plea, you gain 12% dodge for 10 sec. 2 P: (Updated) Your melee attacks have a 40% chance to reset the cooldown on your Divine Storm ability. 4 P: (Updated) Your Seals and Judgements deal 10% additional damage. (PREVIOUS) 2P Bonus – Your Seals and Judgements deal 10% additional damage. (PREVIOUS) 4P Bonus – Your melee attacks have a 4% chance to reset the cooldown on your Divine Storm ability.